Applied kinesiology is a holistic approach to diagnostics that assess the structural, chemical and mental balance of the body. This process is completed through a manual muscle technique that evaluates innate muscle responses for the presence of any weakness, disruption or dysfunction among the body’s meridians. 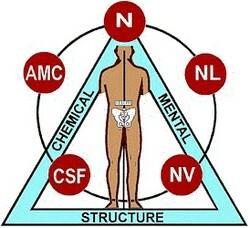 Once any cause for disruption, blockage or imbalance has been identified through the applied kinesiology response technique, an appropriate therapy or combination of natural treatments can be determined. In 1964, Dr. Goodheart observed that a weak muscle could be treated and the strength immediately improved. This began his search for other treatments that could improve muscle strength and, along the way, he discovered factors that could negatively affect the strength and functioning of muscles.